You’ve been there haven’t you? In the checkout queue at your local supermarket. You will already have taken care to stack the items in the trolley in accordance with the Feng Shui Principles of Optimal Utilisation. Carefully, you remove your objects from the trolley and onto the conveyor belt. You have a pattern, an order, to guide you. Large, bulky items like detergents and washing powders, tissues and household cleaners, these are first on the belt. Then food stuffs that are in pots, jars and cans, such as beans, passata, lasagne sauces, teas and coffees, cereals, beers and wines. Then ‘real’ foodstuffs: pizzas, fish, and meats (for The Boss and I still occasionally partake and The Girl eats meats regularly), potatoes, vegetables and fruits. And, finally, those fruits and foods that come pre-packed in bulky transparent plastic containers (grapes, peaches, summer fruits, etc); they get a bag all to themselves. If you get the loading and bagging right, unpacking and putting-away at home is a doddle. Professor Henry Brubaker of the Institute of Studies has shown that structured bag-packers can save up to 1,300 kilojoules of energy compared to people who load/unload their belts/bags randomly, AND take 1/6th less time!1 Yes, I am a little compulsive in these matters. And rightly so, say I. Anyway, there you are, belt loaded. You look up and see that a local charity is collecting (a good thing) but (horrror) a teenager is preparing to help you do the bagging, or (much, much worse) a MAN is. In either of these situations the ‘help’ is 99 times out of 100 no help at all. All that careful loading of the belt would be for nought, as the teenager/man grabs at anything and everything that comes through the till and down the belt; detergents go in with comestibles, fruit with cans that cause bruising, and so on. Unpacking and putting-away at home will take forever. I have a rule of thumb; if the charity helping that day is the local Down Syndrome (DS) society, the Rubicon Dance company, or a local Multiple Sclerosis group, I will let them help come what may. They are charities close to my heart and I think that allowing the helper to feel useful is worth more to me than the downsides caused by inefficient packing. If any other charity is collecting I refuse their offer of help but put cash into their bucket when I am through with my rigorously efficient packing regime. Yes, an alternative would be to tutor the ‘helper’ in the joys experienced when the fine art of bag-management is perfectly completed. If I could be guaranteed having the same helper I tutored last time next time it would be time well-spent. But the likelihood of getting the same helper three months on is close to zero (Brubaker, again). Thus, taking a strictly utilitarian stance, you will see why tutoring them wastes my time in the present and offers close to no chance of future benefit to me. This weekend I broke my own Code of Packing. It is with some deep unease I must admit that even I have achieved a Perfect Pack only twice in my entire life. I was on course to make it a third when a supermarket staff member came along. She was relieving my checkout till-lady and said “I can help while I’m waiting if you like”. She was a teenager and I knew I should say “no thanks I’ve got this”. But I meekly surrendered and said “thanks yes do please help”. Immediately, she grabbed at the items and popped things into the wrong bags in the wrong order, as I knew she would. And yes, when I got home, I lost much more than the 1/6th saving in time that otherwise I might have gained. What made me wander from the Seven-fold Path of Packing Perfection? Simple, she was impossibly pretty. That’s all it took. A salutary tale to which I hope you will all pay attention. The Girl loves coming shopping with me. In fact, she is still petite enough that she can fit into the baby-seat of a supermarket trolley. Not that she wants to. She much prefers shooting-off down aisles hither and yon, out of my sight and causing me no end of angst. Partly to avoid such worries we’ve taken to shopping online. It was during one of these sessions that she informed me that “I’d like a computer like yours for my 11th birthday next March”. Putting aside my quiet satisfaction that she was expressing a preference for a PC over any Apple product, I reminded her that she had already put in a bid for a camera, a PS4, and a ‘toy with a lasso’. We came to a deal that maybe The Boss and I would consider some of those requests if The Girl demonstrated further attainment in maths, reading, writing, speaking, and listening. She agreed and, so far, has been as good as her word. What’s more, she has fun doing maths with her mum no less! It was posted on an online DS group by a parent seeking feedback. It’s fair to say that the overwhelming parental response was “eeuw, ugly, unnecessary, stereotypical, hate it, all our kids look different, my child doesn’t stick out her tongue”. One mum noted that the doll had been created by a doctor, adding “…I hope he’s a better Paediatrician than he is a doll-maker”! Others didn’t mind the tongue but felt that the clothes were a throwback to the 1950s and could do with being refreshed. Let me offer some context. People with DS generally have smaller mouths and higher palates, which makes it appear as if they have a larger tongue than usual. They also have lower muscle tone (hypotonia) than typically developing children and the tongue is a muscular organ. Finally, people with DS sometimes have narrower airways, as a result of which it is easier to breathe through their mouths, protruding their tongue. These are very general comments; each person with DS has his or her own individual differences – just like all the rest of us. The Girl will stick her tongue out either when she is deep in concentration or when she is very tired. I’ve always remembered one mum telling a group of us parents how her young son had been in a chip shop queue with her. Another parent and child who had DS came in and the first child turned to his mum and said in excitement “Looks like me!” and gave a thumbs up. And that’s why I think there is a case for these dolls. 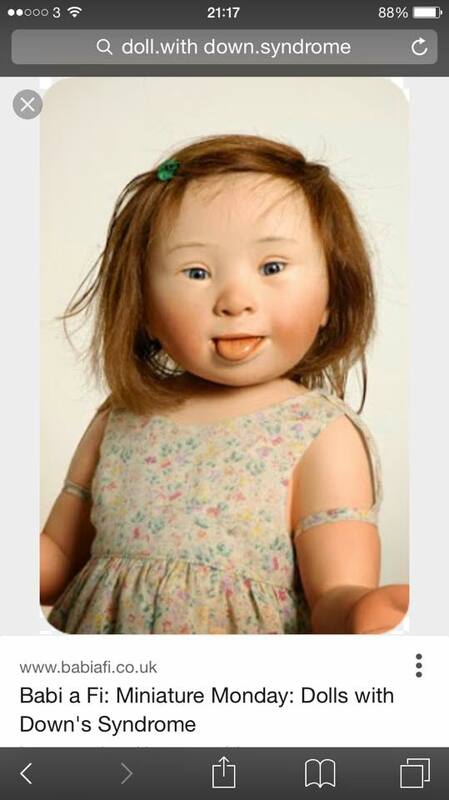 I guess it is a part of the same sort of initiatives that manufactured black- and brown-skinned dolls, and dolls with disabilities; to allow kids with DS to see dolls that ‘look like them’. Some adults hate it because we don’t see our kids as having disabilities. I did some online research and found one telling caveat3. Working with forty-one kids aged 4-17, using dolls depicting DS and, also, ‘typical’ (traditional) dolls, a researcher found that “some children were quite aware of the differences between the dolls’ appearance… [She] recalled one girl who, when asked which doll has the most friends, pointed to the typical doll. She said that was because the other doll has DS. Other participants never said the name of their condition, but mentioned that the DS doll was teased”. But they aren’t offensive and The Girl certainly recognises aspects of herself in the doll. And surely that is good? It means that she now wants a “DS Doll” (her phrase) for her birthday, alongside that computer, camera, PS4, and ‘toy with a lasso’. Thinking about that list it occurs to me that I could buy everything but the doll at the local supermarket; but I’d be sure not to let anyone else pack them for me.